Imagine standing on the wing of a 1920’s-era biplane, a five-gallon container of gasoline secured to your back, preparing to jump and hoist yourself onto the wing of a second plane. Now imagine you are attempting this feat while in mid-flight, high above Long Beach, California. 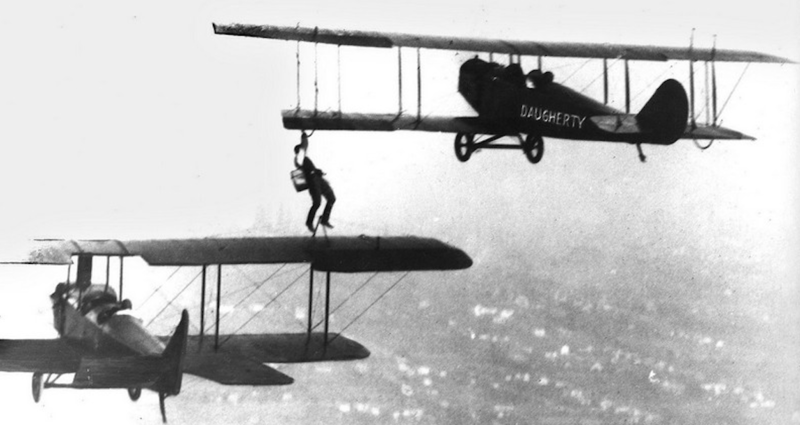 This scenario was reality for Wesley May on November 2, 1921, when he became the first person in history to refuel an aircraft while in flight. Although May and stunt pilots Frank Hawks and Earl Daugherty may not have intended to change history, their act has become a symbol of the beginning of an era of aerial innovation. Lieutenant Alexander P. de Seversky (a Russian naval aviator during World War I who later established the Seversky Aircraft Company in Long Island, New York), developed the idea of mid-air refueling using a hose between two aircraft. In 1921, he received the first air refueling patent for his invention. On June 27, 1923, the U.S. Army Air Service successfully used de Seversky’s method to transfer fuel through a hose between two Airco DH-4B biplanes flown by Captain Lowell H. Smith and Lieutenant John P. Richter. As air refueling became more of a reality, its application for transatlantic flights and quicker mail delivery sparked an increased interest. Thanks to the advent of fighter jets such as the F-80 Shooting Star and F-84 Thunderjet, air refueling research gained particular momentum following World War II. Fighter aircraft consumed fuel at an unprecedented rate, limiting the length of time they could remain in the air. Additionally, shipping these crafts to overseas locations caused extreme repair issues due to exposure to salty air and corrosion. Concurrently, numerous projects (including Tip-Tow, Tom-Tom and FICON) sought to prolong the time fighter jets could remain in the air by towing them with other aircraft. With aircraft operating in such close proximity to one another, accidents were inevitable. Unfortunately, leading projects were ultimately cancelled after a devastating collision in April, 1953. Although towing had proven to be too dangerous for further exploration, research involving air refueling proliferated. British aviator Sir Alan Cobham (also a member of the Royal Flying Corps in World War I) conducted refueling experiments as a founding member of Airspeed Unlimited. In 1949, using Cobham’s grappled-line looped-hose refueling method and KB-29 tankers, B-50A Lucky Lady II became the first aircraft to circle the globe without stopping. The primary air refueling systems in use today were first implemented in the 1950’s. These include the probe and drogue system and the boom system. United Kingdom Flight Refueling Limited created the initial probe and drogue system, in which a flexible hose from a tanker craft is dropped to a funnel or basket-like apparatus on the receiving craft. The fuel line then connects through a retractable probe on the receiving end. On October 22, 1950, United States Air Force Colonel David C. Schilling completed the first non-stop fighter jet flight across the Atlantic Ocean, thanks to the Probe and drogue refueling system. Boeing’s flying boom system is also widely used, relying on operation of a rigid, arm-like tube from inside the tanker craft. The tube is guided to the receiving port on the jet being fueled. In 1950, the Boeing B-29 became the first aircraft to use the boom system in flight. On July 12, 1980, the United States Air Force conducted the first flight of the KC-10, a tanker aircraft equipped with both a boom refueling system and a probe and drogue refueling system. These features allow the tanker to refuel aircraft from all branches of the United States military (and many belonging to allied forces) in a single mission. Today, Air Force boom operators are required to complete twenty eight days of specialized courses following basic training, with continuing education throughout their careers. Air Force pilot training involves multiple years of academic and in-flight requirements. Present-day military missions continue to utilize the discoveries and inventions of the world’s aerial pioneers. Although refuelers no longer jump from one aircraft to another with five-gallon tanks strapped to their backs, similarities remain. Perhaps no similarities are more admirable, however, than the dedication and resolve exhibited by all men and women who refuel jets in the sky.